Found in the picturesque fisherman village of Trou aux Biches, Villa Belle Vue 2 is a self-catering beach villa designed to comfortably accommodate families and groups who want to enjoy proximity to the glistening Indian Ocean. Indeed, with a stay at this villa, the ocean will literally be at your doorstep. More importantly, this villa comes with everything you may need to enhance your holiday in Mauritius. 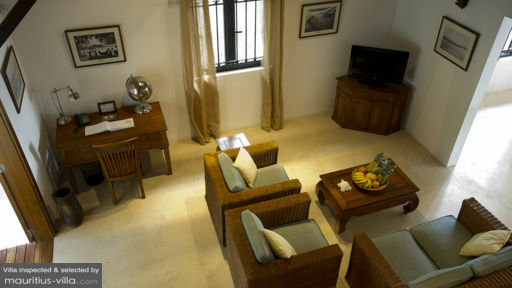 Villa Belle Vue 2 boasts two beautifully-appointed bedrooms that can very comfortably sleep up to four guests. Measuring eighteen square meters, the master bedroom boasts a double bed, closet as well as an en-suite bathroom with two wash basins, hair dryer, toilet and a spacious shower. In the second bedroom, you’ll also find a dressing and double bed, along with an en-suite bathroom that comes with a single wash basin, toilet and shower. Villa Belle Vue 2 is beautifully nestled in a large green garden which opens directly onto the beach. Outside, you’ll find a large saltwater swimming pool, ideal for a refreshing dip when you want to escape the island heat. 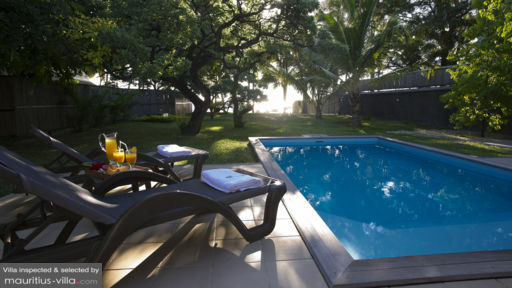 The garden also boasts sun loungers where you can lie back and relax as you enjoy the warm rays after an eventful day of Mauritian adventures. Because the garden leads directly onto the beach, you’ll be able to go for an invigorating swim in the ocean whenever you feel like it. An exterior dining table has also been set up for Al Fresco dinners. Airy, spacious and inviting, the living areas of Villa Belle Vue 2 have been conceived with exquisite attention to detail in order to feel just like home. The generously-sized living room boasts a 27’’ flat screen television with French and English satellite channels for those lazy days in. There’s also a coffee table, sofas, armchairs and even a lunch table and chairs. Rest assured that the kitchen does come with everything you’ll need to prepare your meals. For example, you’ll find a coffee machine, toaster, microwave and more. A barbecue for six persons has also been set up for fun nights with your friends and families. Guests of Villa Belle Vue 2 are entitled to a plethora of services to render their holiday in Mauritius as relaxing as possible. Therefore, a housekeeper will show up every day to take care of tedious house chores. Upon request and for an added fee, you can also hire the services of a local cook who will be happy to prepare local delicacies for you to sample right in the intimacy of your villa. Other services include general maintenance, pool maintenance and gardening. Villa Belle Vue 2 places you near the public beach, where you can enjoy a variety of fun nautical activities, such as marine excursions, snorkelling, sailing, deep sea fishing, water skiing and diving. 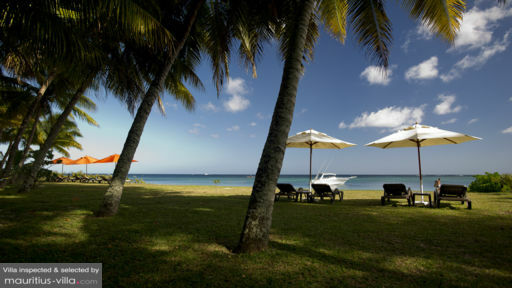 A short drive away is found the energetic village of Grand Baie, which is often described as the New York of Mauritius. This tourist hub boasts casinos, nightclubs and just about every type of restaurant you can think of. If you’d like to indulge in some shopping, rest assured that the capital of Port Louis is only half an hour from your villa.